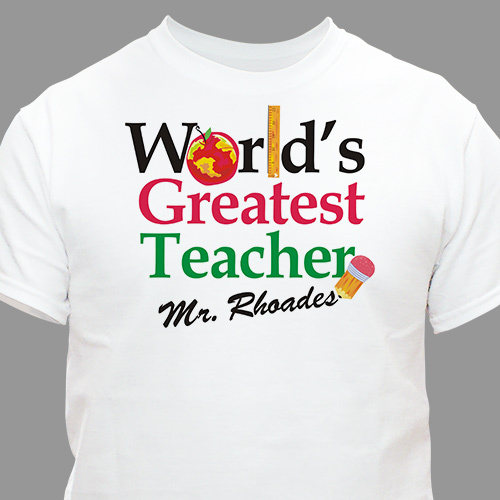 Your child's favorite teacher will look great and feel even better in this comfortable Personalized Teacher T-shirt - which, by the way - makes a perfect teacher gift! Our machine-washable personalized T-shirt is available on our premium white 100% cotton T-Shirt in adult sizes S-3XL. Buy personalized teacher gifts today, they included free customization every day. Additional Details Make sure your child's teacher feels appreciated for all the hard work they do! This customized teacher key chain is a popular and affordable gift. Shop the rest of our selection of occupation gifts, with lots of careers represented!